I’m a simple girl with a simple beauty beauty routine. I like beautiful, classic styles and rarely stray from them. In fashion or beauty, I keep things simple. And it works for me. Have you ever heard someone say, “The little black dress…again. Or, the ponytail is so dated.” You haven’t because it doesn’t happen. These are staples. Classic fashion and beauty options that are always a success. While I’ve dabbled with cutting off my hair or switching up the colors, I know what works for me and all always come back to it. Straight, long, blonde locks is my usual look. Honestly, I don’t mix things up as much as maybe I should. I know what works for me and I rarely deviate. Put a wedding or special event at me and I get a little panicky trying to figure out how to style my hair. Although honestly, I don’t know why I worry. There are ways to embrace and enhance a classic look to make it fit for any occasion. Last weekend was Father’s Day and a fun dinner out. I had already settled on a new dress and since we were dining al fresco in the middle of the day, I needed a look that was simple and fitting. I settled on a classic and youthful voluminous high ponytail for the day. It worked perfectly and appeared to have taken much more effort and skill than it actually did. This look would work perfectly for anything from a special night out to a wedding! Ready to create the voluminous high ponytail for yourself? Check out these easy steps below! 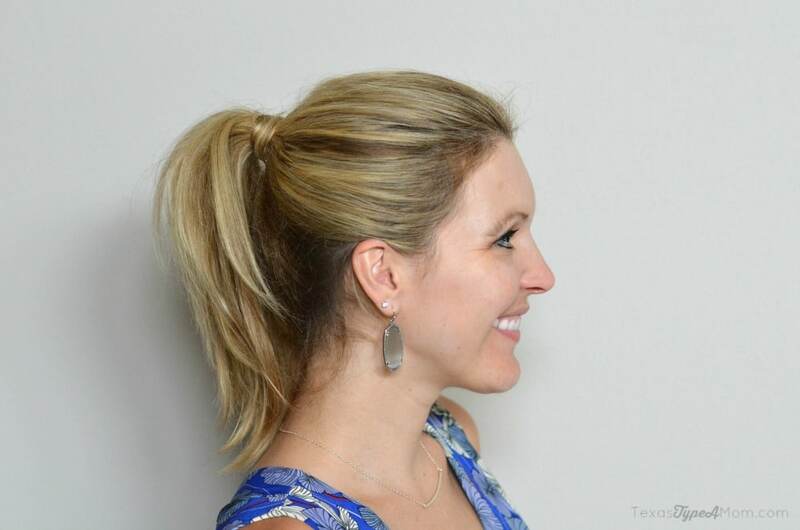 This Easy Voluminous High Ponytail Tutorial was sponsored by Suave. 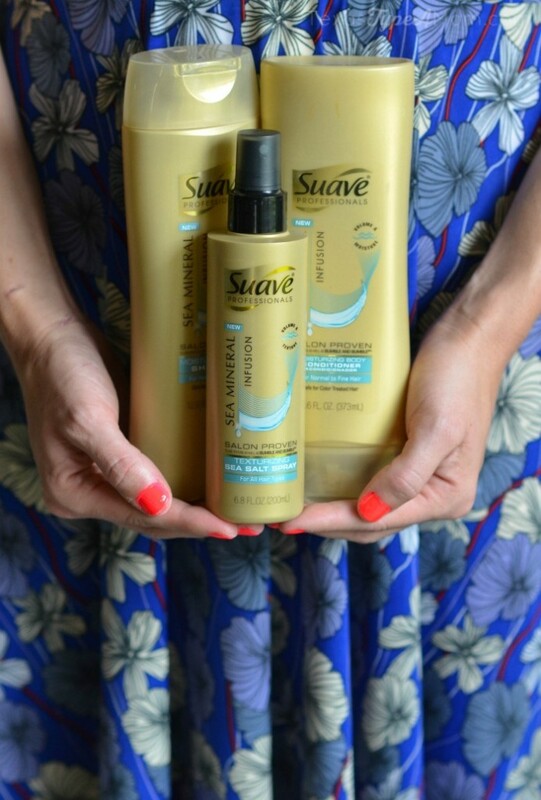 To begin, prep your hair by washing and conditioning with the Suave Professionals Sea Mineral Infusion Moisturizing Buoyant Body Shampoo and Suave Professionals Sea Mineral Infusion Moisturizing Buoyant Body Conditioner which provides hair with moisture that makes it easier to style. Lightly spray all over with the Texturizing Sea Salt Spray. This spray ensures body and texture to achieve your desired look. 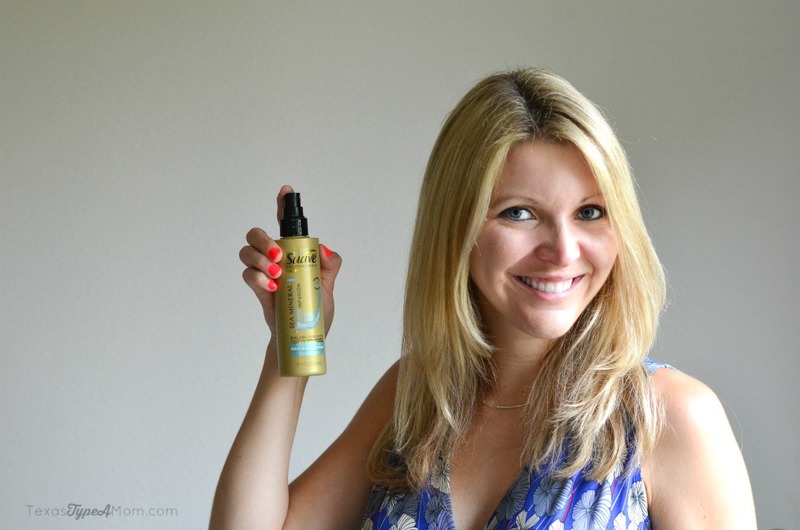 Without this spray my hair lacks body and the texture needed to achieve a voluminous, full-bodied hairstyle. Split hair into a top and bottom section. 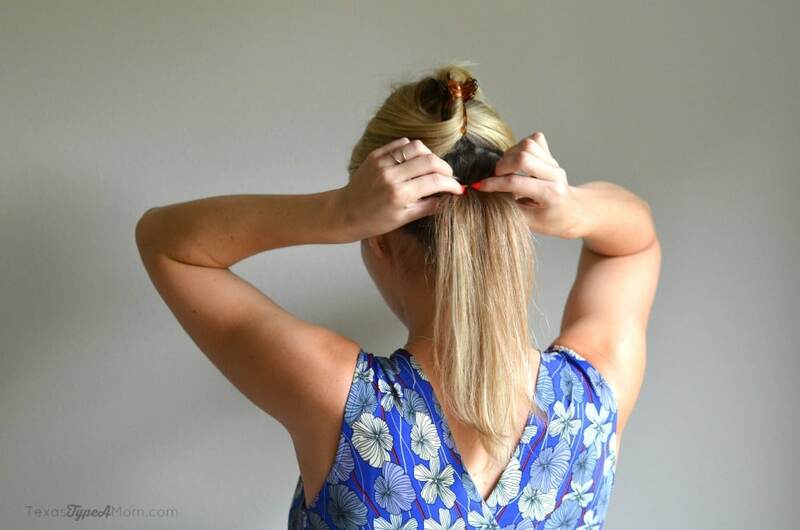 Gather the bottom section into a ponytail and secure with a hair tie. Clip the top section off and twist towards your crown. Backcomb (or tease) the top portion of hair by taking your comb and going the opposite direction as you would comb it out. While it appears messy, this creates fullness and body. Once you’ve finished back combing your hair, remove the clip and combine hair into one ponytail. At this point, you can spray your hair to set. 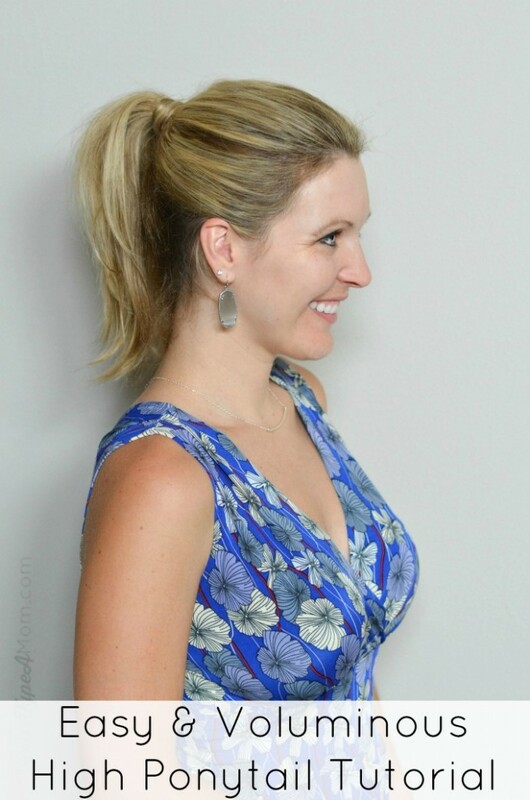 Or, you can take a small section of hair from the ponytail to wrap around the hair tie and secure with a bobby pin for a more finished and elegant look. 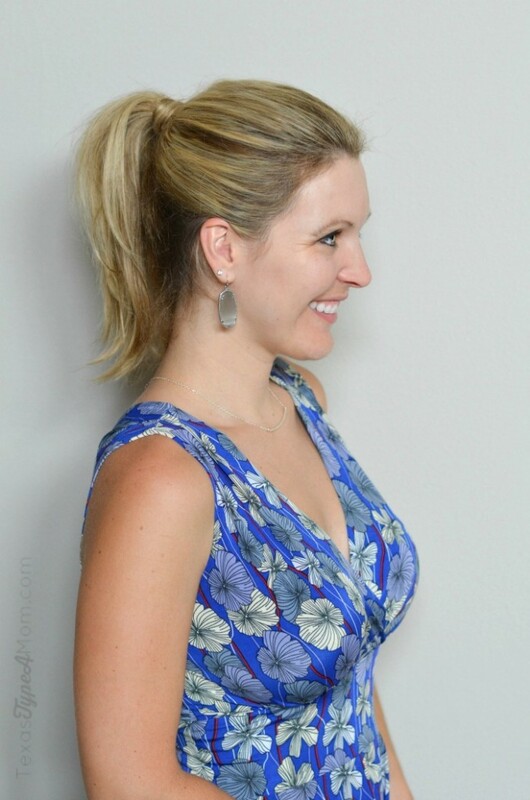 These easy steps provide an easy and voluminous full ponytail that’s perfect for any occasion. Who says ponytails are boring? What’s your go-to hairstyle? !